A Kuwaiti Instagram star has been slammed for criticising new laws introduced to improve conditions for Filipino domestic workers. Make-up artist Sondos Alqattan, who has 2.3million followers, was outraged that 'servants' would have a day off every week and be allowed to keep their passports. She posted her furious rant online and it has since gone viral, attracting critical comments from social media users in the Middle East and Philippines. Reforms were introduced in May to protect the rights of Filipino domestic workers in Kuwait, which lies between Iraq and Saudi Arabia. The agreement followed months of strained diplomatic relations between the two countries over treatment of overseas employees. In February, the Philippines issued a temporary ban on workers travelling to Kuwait after a 29-year-old Filipino was found mutilated in a freezer in an abandoned flat. 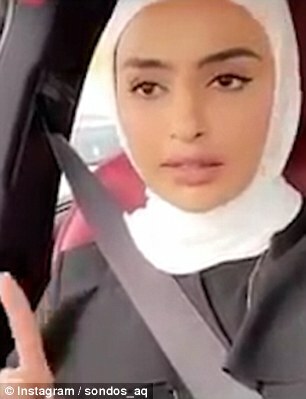 Alqattan's video, which she filmed while sitting in the front seat of a luxurious car, provoked uproar. It added that the social media icon had 'a backward outlook which literally belongs to the dark ages'. Critics are demanding that Alqattan's sponsors drop their lucrative endorsement deals with her. Brands that she has worked with in the past include Max Factor and MAC Cosmetics. An estimated 660,000 domestic migrant workers are living in Kuwait, which has a population of four million. I absolutely despise people like her. Despicable B****! This heifer is crazy! Even the Most High rested one day! She think people are supposed to be her slave!